I installed the feeder and started filling it with suet about a month ago. 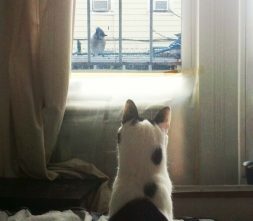 It took a few weeks, but eventually birds started coming by regularly. At first they were extremely hesitant — I’m sure seeing two alert cats through the screen and window was a bit unnerving at first! But eventually they seemed to realize that Kura and Peyton couldn’t get out. (They are both indoor-only cats.) The feeder itself is attached to the top bars of my air conditioner cage, so its location is also safe from the many feral cats in my neighborhood. 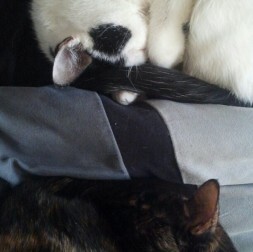 A month ago I never would have caught Kura and Peyton sleeping so close. Now they do it all the time. Overall, it’s a great arrangement: the wild birds get a safe place to snack, my cats get a fun distraction and I get to see the surprising variety of bluejays, cardinals, sparrows and other birds that live in NYC. The surprising part is how much it’s changed the relationship between my “kids.” I’ve had Peyton as a foster for almost a year now and Kura and Peyton would barely tolerate each other. Whenever one came too close, hissing and posturing would start. But since I installed the feeder, both have started sharing space more readily. They even sleep within a few inches of each other now — something Kura has never done with a foster cat in the last thirteen years. Who knew? TELL US: Do you have a bird feeder where your cats can watch the birds? Do you do anything else to promote harmony among your pets?